What’s the deal with lampwork beads? Lampwork or flamework is the term used to describe glass beads made by melting glass with a torch and wrapping it around a steel rod. The techniques used to form and festoon the glass haven’t changed much since the first core formed vessels made in ancient Egypt. 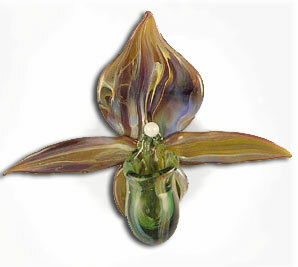 Do you know the difference between a true artisan glass bead and an import? Self representing artisan lampwork has become widely available. If you are seeing large strands of lampwork beads selling for $3.00, chances are, it’s imported, not annealed, and definitely not made by one artist. Annealing is the process an artist uses to slowly cool the glass bead to ensure strength and durability and to keep the bead from sudden thermal shock. Beads are placed in the artist’s kiln and cooled over time. The annealing time can depend on the size of the bead, the type of the glass used, and the complexity of the piece.